On this date in 1610, Henry Paine was executed on the island of Bermuda for mutiny. Paine arrived on the island most unfortunately on the Sea Venture, the flagship for the London Company bound for the New World under the command of Admiral George Somers. Her freight was approximately 150 passengers, among them Sir Thomas Gates, who had been appointed as the new governor of Jamestown, Virginia. The ship was caught in a hurricane and wrecked near the Bermuda Islands in July of 1609. All aboard survived the wreck, and they took up temporary settlement on the islands. Neither natives nor other Europeans had settled there, possibly due to the difficult weather conditions. The castaways determined that they could rebuild and continue to Jamestown using many of the salvaged supplies and parts of the wrecked Sea Venture; Gates and the colonists began building while they waited to hear back from the rest of their fleet — six other ships which had sailed on to Virginia. But no word came, and soon enough a dispute between Somers and Gates over who held command split the survivors into factions. Somers and his crew of mostly sailors relocated to a nearby island and began work on a smaller ship. Throughout the winter months, both factions worked to build amid growing discord. William Strachey, who chronicled the events firsthand in his account entitled A True Reportory of the Wreck and Redemption of Sir Thomas Gates, Knight, upon and from the Islands of the Bermudas: His Coming to Virginia and the Estate of that Colony Then and After, under the Government of the Lord La Warr, July 15, 1610, makes it clear that he did not exactly find Bermuda to be a tropical paradise. But repeated attempts at mutiny suggest that many of the colonists thought it might be nice to just stay put. Jamestown, after all, was struggling through a period known as the Starving Time, and the population had dwindled by more than 80% in recent years thanks to famine, illness, and a hostile relationship with nearby natives. In Bermuda, food — fruit, fish, and wild hog — was plentiful. In March of 1610, both vessels were nearing completion, forcing the dissident factions to either go along with the colonization plan or try one more time to break free. Henry Paine, hardly more than a footnote in the more spectacular tale of the shipwreck, survival, and remarkable eventual landing at Jamestown, was apprehended for stealing supplies to be used for a mutinous group that hoped to relocate to another island and remain there. He assaulted the commanding officer and said some very naughty things about the governor, which would prove to be his doom (particularly since Gates’ own toughness had come into question after prior pardons for both mutiny and murder). Paine replied with a settled and bitter violence and in such unreverent terms as I should offend the modest ear too much to express it in his own phrase; but the contents were how that the governor had no authority of that quality to justify upon anyone (how mean so ever in the colony) an action of that nature, and therefore let the governor (said he) kiss, etc. Which words, being with the omitted additions brought the next day unto every common and public discourse, at length they were delivered over to the governor, who, examining well the fact (the transgression so much the more exemplary and odious as being in a dangerous time, in a confederate, and the success of the same wishedly listened after, with a doubtful conceit what might be the issue of so notorious a boldness and impudency), calling the said Paine before him and the whole company, where (being soon convinced both by the witness of the commander and many which were upon the watch with him) our governor, who had now the eyes of the whole colony fixed upon him, condemned him to be instantly hanged. And the ladder being ready, after he had made many confessions, he earnestly desired, being a gentleman, that he might be shot to death, and toward the evening he had his desire, the sun and his life setting together. Aside from his being a gentleman (and thereby having his preferred method of execution), little has been written about Paine. But the several Virginia Charters issued by this time gave the governor of a colony broad authority to convict, punish, and execute criminals in this manner. Paine’s execution seemed to put a stop to most rumblings of mutiny; Somers and Gates set aside their differences and the two ships, Deliverance and Patience, were soon completed. The marooned men and women set sail again on May 10, 1610 and successfully made their way to Jamestown. Two of those lost on Bermuda in the interim were the wife and infant daughter of John Rolfe, who would later go on to famously marry Pocahontas. Three men did successfully desert the company and remain behind on Bermuda: Robert Waters, Edward Chard, and Christopher Carter. When the British returned to claim and settle Bermuda properly in 1612, they were all seized, imprisoned, and shipped back to England. Captain Somers returned to the islands later in 1610 hoping to collect supplies for Virginia, but he became ill on the journey and died in Bermuda (which was for a time later referred to as The Somers Isles). The story of the Sea Venture is often cited as a possible inspiration for William Shakespeare’s The Tempest, which was written around the same time period and includes a similar storyline of a shipwreck and disputed leadership … but has a lot more magic in it. On this date in 1610, the priest Roger Cadwallador was hanged, drawn, and quartered in Herefordshire, where he had maintained an illicit Catholic ministry for 16 years. Having spent most of the morning in spiritual preparation (for his end) about ten o’clock he took some corporal food, viz. 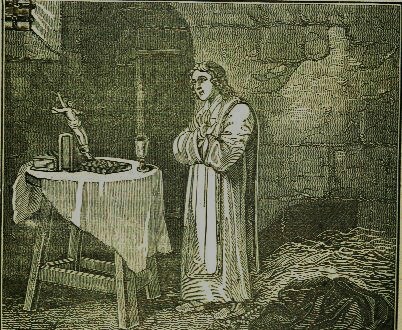 a little comfortable broth; and calling for a pint of claret wine and sugar, on occasion of a friend that was come to visit him, he made use of the words of bishop Fisher in the like case, as he said, when he was taking a cordial, before the like combat of death; fortitudinem meam ad te domine custodian, Saying in English, he took it to make himself strong to suffer for God. Then as if he had been to go to a feast, he put on his wedding-garment (viz. a new suit of cloaths) which a friend had provided for him, from top to toe, whom he requited with a good and godly exhortation, counselling him to persevere till death in the catholic faith; and giving him directions to bestow twelve pence of his money on the porter; for he kept two shillings in his own pocket to bestow on him that was to lead and drive the horse, when he went to execution. His jailer pressed him repeatedly, as was usual, to apostasize and save his flesh. The terrors of the gallows being quite real even to martyrs, this menace surely worked for some … but never, it seems for those who reach these grim annals. Being taken off the hurdle, and brought within sight of the gallows, and the block whereon he was to be quartered, they shewed him these and other instruments of death, leading him between two great fires, the one prepared to burn his heart and bowels, the other to boil his head and quarters: and thinking the sight of these did somewhat terrify him, they promised him once more that none of them should touch him, if he would take the oath; but his christian courage made him persist in his resolution of dying in that quarrel. came to turn the ladder … [Cadwallador] said aloud five or six times, In manus tuas Domine commendo spiritum meum. Into thy hands, O Lord, I commend my spirit. And lastly, Domine accipe spiritum meum. Lord receive my spirit. He hunt very long, and in extraordinary pain, by reason that the knot, through the unskilfulness of the hangman, came to be directly under his chin, serving only to pain, and not to dispatch him. Insomuch that when the people were persuaded that he was thoroughly dead, he put up his hand to the halter, as if he had either meant to shew how his case stood, or else to ease himself: but bethinking himself better, and perhaps a scruple coming into his head to concur to hasten his own death; he had scarce touched the halter, but that he presently pulled away his hand. And within the space of a Pater-noster after, he lifted up his hand again to make the sign of the cross; which made all the standers by much amazed; and some of the vulgar desirous to rid him of his pain, lifted him upwards by the legs twice or thrice, letting him fall again with a swag. Then after a little rest, when they thought him quite dead, he was cut down: but when he was brought to the block to be quartered, before the bloody butcher could pull off his doublet, he revived and began to breathe; which the multitude perceiving began to murmur; which made the under-sheriff cry out to the executioner to hasten: but before they had stripped him naked he was come to a very perfect breathing. It was long after they had opened him before they could find his heart, which, notwithstanding, panted in their hands when it was pulled out. As soon as the head was cut off, one of the sheriff’s men lifted it up on the point of a halbert, expecting the applause of the people, who made no sign that the fact was pleasing to them. Nay, they that were present were struck at the sight, and said, this priest’s behaviour and death would give great confirmation to all the papists of Herefordshire: which saying fell out to be true; for it ministered to them great courage and comfort. Cadwallador was beatified in 1987. 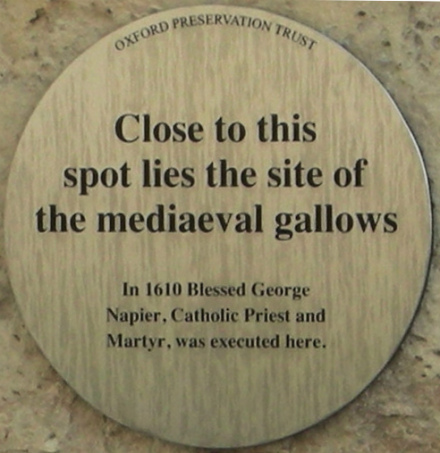 On this date in 1610, the Catholic priest George Napier (or Napper, or Nappier) was hanged, drawn, and quartered at Oxford, having said Mass that very morning. From here, attributed to Richard Challoner‘s Memoirs of Missionary Priests. A son of Oxford himself who went abroad to France for ordination in his outlawed faith, Napier cut a fairly typical martyrology for the Catholic clergy. He was caught red-handed with the implements of the Roman church, refused to avow the supremacy of the English crown, and aggravated his offense by converting a fellow-prisoner to Catholicism. 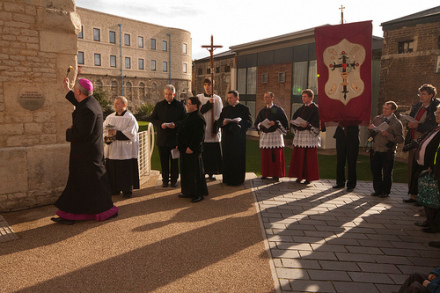 This unfortunate has made headlines recently around the fourth centennial of his martyrdom, for which occasion a pilgrimage of Catholic faithful unveiled a plaque in Nappier’s honor at Oxford Castle. Archbishop Bernard Longley blessing on Oct. 23, 2010 the marker honoring George Napier. Images on this page (cc) Joseph Shaw.